In the heart of the Loire Valley,enjoy both the dicover of loire castles (Blois, Chambord, cheverny, Chenoceaux) and a beautiful nature. Walk or bike along the loire river that you can reach in a few minutes. Our house is for old buildings lovers: a sitting room is installed in a cellar with a pillar dated of the XIVth century, stones of "tuffeau" and exposed beams. Enjoy a pretty garden closed withe a stone wall as well as a wooden terrace. Ideal for friends or families that whant to spend their holidays together. "We loved this house! It is big, warm and full of character. We were a group of 6 adults and 5 young children. There was space for everyone; we didn''t feel crowded and there were plenty of toys, books, DVDs and bikes for all the children. The number of bedrooms are split in two levels so my 2 y.o. daughter could sleep without hearing the noise from the others. It is a very peaceful and quiet area with a handy bakery down the road. Highly recommended." "We enjoyed our stay at Clos des Roses. 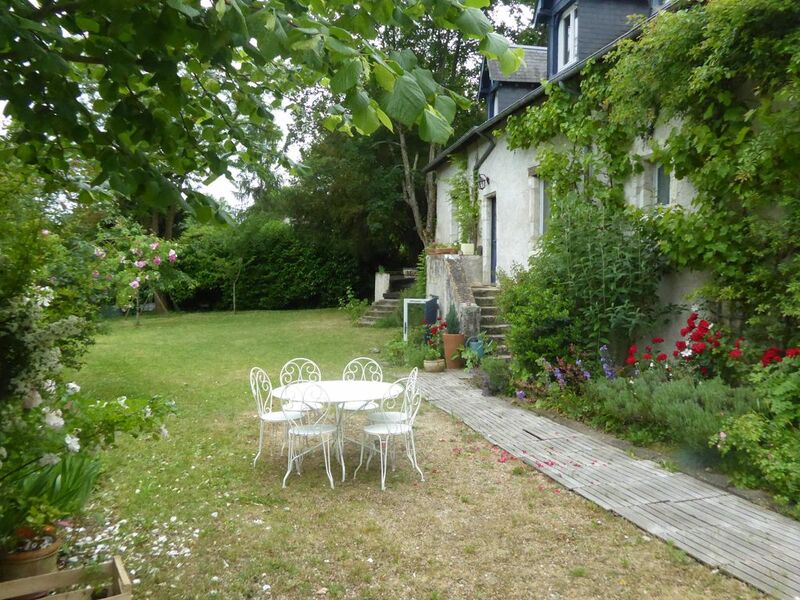 It is a very comfortable house and very close to the Loire and also to the boulangerie. It is a good house for a stay with several people. It is quite a long walk along the river to Blois - nearly an hour - and the public transport is not very frequent so it is definitely advisable to have a car." Maison de famille bien située pour visiter Blois, Chambord et Cheverny et passer de bons moments en famille ou entre amis !!! deuxième grand week-end familial au clos des roses: toujours aussi agréable. Une vraie maison de famille, très vivante, très spacieuse. On s'y sent un peu comme chez soi. Le séjour était trop court mais nous en avons profité pleinement. La terrasse est très agréable (manque seulement un peu d'éclairage en cette saison). La Loire est tout près avec ses pistes cyclables. Un très bon moment. take the motorway A 10 until Blois, then follow the direction "La Chaussée saint-Victor". When you reach the national road 52, turn left until you find a pharmacy on your left. Then turn right. Well done! You're rue de la Loire and the house stay at the number 43. Of course a trip into Renaisance by visiting the marvellous castles of Loire: Chambord, Cheverny, Chenonceaux, Amboise... But also a very restful stay by walking or riding along the wild Loire that you reach within few minutes from the house. Une semaine avant la date d'arrivée, le locataire prend contact avec Mme Piedallu, la personne en charge de l'aacueil des locataires et de l'entretien de la maison. Ils conviennent ensemble d'un rendez-vous sur le place pour les formalités d'arrivée dont la remise des clés et de la caution.